sale at the parish office or after weekend masses. STATIONS OF THE CROSS Every Friday starting March 8 at 7:00 pm. If you or someone you know has left the church Corpus Christi will have informal sessions for non-practicing Catholics beginning in September. 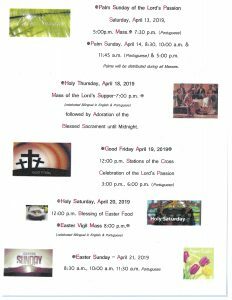 For more information, please call the parish office. One of the many ways to evangelize is through prayer, Corpus Christi has received from the Diocese of Metuchen in accordance with Bishop James Checchio’s request of all parishes a Traveling Prayer Kit of Our Lady of Guadalupe to visit families. The Kit includes an Image of Our Lady of Guadalupe, standing crucifix, votive candle, four rosaries in the rosary pouch, holy water bottle, and pamphlets on how to pray the rosary. If you are interested in receiving the visiting prayer kit, please call the parish office and we will add your name to our list. All are invited, 7:30-8:30 p.m. South River Library – Sivess Room. We meet the first Monday of every month for an evening of great conversation with other women who share your faith. The discussions will be informal, friendly, and uplifting. Topics will range from raising a family to career, stress, marriage, joys, sorrows, and more. RSVP’S requested however walk-ins welcome. Call/text 732-801-3569 to rsvp or with any questions. All are welcome. We are asking parishioners to consider donating a hymnal as a memorial gift, for the cost of $25.00 per book. A label will be placed in the front cover of the hymnal dedicating the book to the prayerful memory of your loved one. We are excited to announce that Corpus Christi Church has become a partner in an exciting 24/7 on-line web-based digital formation series called FORMED, produced by the Augustine Institute and Ignatius Press. This series is designed to help adults grow in their faith at all levels – how we think, how we pray, and how we live. Better yet, access is FREE to all of our parishioners and their families anywhere, anytime on computers, tablets, or phones. REGISTER FREE USING OUR PARISH CODE ZD3P77. A pictorial directory help us all to put names & faces together to grow in fellowship & to learn more about each other and our church. There is not cost to the church & no sitting fee for your family. You will receive a free 8 X 10 portrait & a free copy of the directory for participation. You will be professionally photographed, choose your pose for the directory & have a chance to make additional purchases all in one trip to the church. Sign-ups for photo shoots will be available early April. Further information will follow. 2019 Lucky Calendars are on sale at the parish office – Buy 2 for $50.00 and get one free! The first Tuesday of every month, a winner is selected from the drum. Even if you win one of the drawings, your ticket automatically goes back in the drum for the next drawing.